Read on Sydney Morning Hearald. Mann & Weil appeared on CUNY TV's Theater Talk to discuss Beautiful: The Carole King Musical. Recording of Mann/Weil/Leiber/Stoller's "On Broadway" added to 2013 Grammy Hall of Fame. The Song That Conquered Radio: How songwriting spouses Cynthia Weil and Barry Mann joined with Phil Spector and the Righteous Brothers to create one of the most-played songs in history, "You've Lost That Lovin' Feelin'." SXSW Day Two: Springsteen's keynote address: After playing a chunk of the 1965 hit We Gotta Get out of This Place (which actually was written by the American songwriting team of Barry Mann and Cynthia Weil), Springsteen declared, "That's every song I've ever written!" Bruce Springsteen Performs with Members of Low Anthem, Arcade Fire at SXSW: He pulled out an acoustic guitar and played a bit of the Animals We Gotta Get Out of This Place (composed by Brill Building greats Cynthia Weil and Barry Mann). "That's every song I've ever written," Springsteen confessed, "Born To Run, Born in the U.S.A., all of them." Springsteen delivers SXSW keynote: The Animals' version of the Barry Mann-Cynthia Weil song We Gotta Get Out of This Place inspired "every song I've ever written" with its class consciousness. 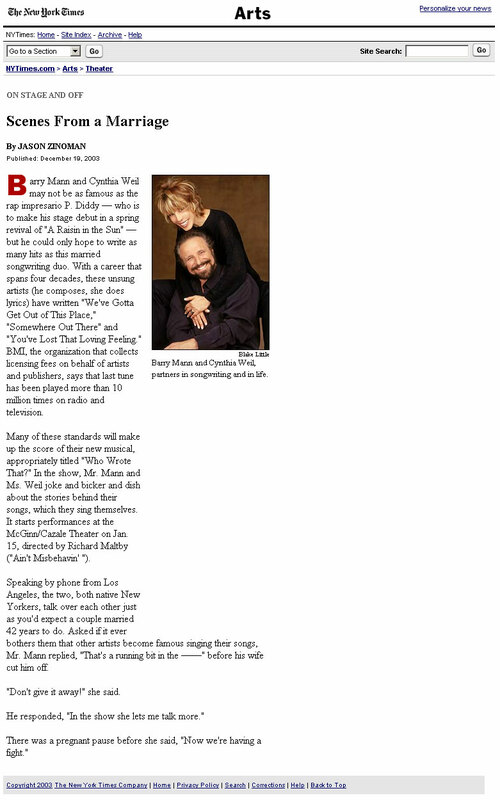 Barry Mann and Cynthia Weil to be honored with a "Life In Arts" award at The Idyllwild Arts Gala on March 11,2012. Performers include James Ingram, Steve Tyrell and Barry Mann with the Idyllwild students. Cynthia appeared on the PBS documentary "Women Who Rock", aired on November 18, 2011. Cynthia appeared on NY1 to talk about Rockin' Babies. Cynthia appeared on Fox Business News to discuss why 'She's Still Got That Loving Feeling', for the music industry. Cynthia's children's board book, Rockin' Babies, co-written with her daughter, Dr. Jenn Berman got a special mention on Extra TV. 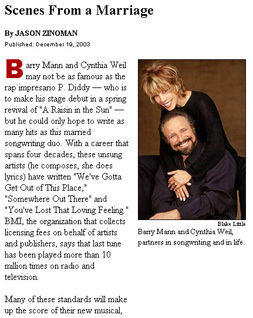 Barry and Cynthia will be the recipients of the prestigious Johnny Mercer Award at the Songwriters Hall of Fame Ceremonies June 16, 2011. Cynthia was quoted in USA Today in an article about Song of The Year Grammy winners. Just to be sure she didn't take herself too seriously, they spelled her name wrong. The following piece appeared in the New York Times on March 16, 2009. The song featured, Just A Little Lovin, was written by Mann and Weil. Barry and Cynthia appeared on the television series, Lyrics and Legends. Barry performed in the round with Motown legend, Lamont Dozer and brilliant songwriter/singer Marc Cohen. Mann and Weil both participated in an interview segment. The show will be aired on PBS in the fall of 09. The Songwriters Hall of Fame honors That Lovin' Feelin'. Barry and Cynthia are one of the seven songwriting teams chronicled in Ken Emerson's book Always Magic In The Air: The Bomp and Brilliance of the Brill Building Era. Emerson manages to combine bios, gossip, music analysis, and social history into a fun and fascinating read. Barry performed at The Whisky a Go-Go in concert for one amazing night with the legendary, yet somehow forgotten, cult rockers "The Possibilities", along with guest stars Carole King, Paul Williams and Gary Burr. Barry and Cynthia co-host the CBS-Fm Morning Show with Mike Fitzgerald. They will be playing their own favorite songs and the ones they wish they'd written, sharing demos, song stories and fielding phone calls. The New York Times, On Stage and Off: Scenes From a Marriage (Jason Zinoman) - The songwriting duo of Barry Mann and Cynthia Weil team up yet again, this time to perform in their own musical at the McGinn/Cazale Theater. Mann and Weil were interviewed by Steve Sailor of United Press International. Mann and Weil were featured in A&E television's two-hour biography of The Brill Building along with Carole King, Jerry Leiber and Mike Stoller and other well-known writers of that period. The program was rerun on September 13th and continues to be shown. Mann and Weil were interviewed on NPR's Fresh Air.